Roads in Fiji are like roads in Haiti. Driving on them requires zigzagging from side to side to avoid major potholes. And though you find yourself on both sides of the road, you have to remember that you are supposed to drive on the left when another car approaches. I got better as the week went on. Pastor John and I went on a road trip to visit Pastor Aaron in Sigatoka. I drove. It took an hour to get to the turnoff. Then after a 15 minute drive on a road that was not really a road, we came to some railroad tracks. Pastor John told me to drive on them with the tracks centered under the car. Then we came to a wide river. He said to keep the tracks under the car and the tires on the second plank on the right and the first on the left. I asked him what would happen if I drifted onto another plank. He said again, “keep the tires on the second plank on the right and the first on the left.” So of course, I did. We passed over the river on a rickety bridge with much earnest prayer on my part. Fortunately there wasn’t a train in sight. Pastor John said this is normal for getting around Fiji. After two days with him, yes, it is normal. I spent Thursday and Friday with Pastor John Chand, the Indo-Fijian national leader of western Fiji. We visited four churches, each of which is reaching out to their Hindu neighborhoods. John has planted dozens of small churches like these around the island. First he goes into a Hindu town to find a “son of peace (Luke 10:1-12).” This person is open to the Gospel, so John leads him to the Lord. 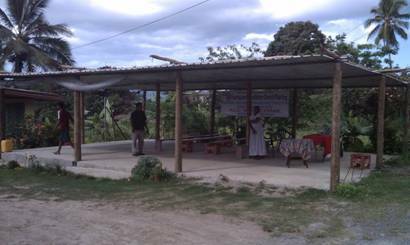 Then has encourages himto start a Bible study in his home with family and the folks from the surrounding neighborhoods. Pastor John will come and assist until the man is able to continue without him. When there are 12-15 believers, he makes hima pastor and he starts a church. That means extending a roof over an area adjacent to your house. Then you begin to have regular services (usually Sunday evening with a midweek Bible study). I met a number of pastors who were brought up this way; Samo, Aaron, Moshme, Swarin and Shiristi. Moshme says that she has about 20 believers in her church, but that 30-45 Hindus come to each service. Each of the pastors had similar numbers. I asked Moshme why the Hindus come and she said, “for the healing.” They are tired of witchdoctors and they know our God heals.” Each pastor had stories of healing. The healings are incredible. Pastor John said it is no wonder they are sick since they worship demons. He should know. He was a Hindu until he was healed by a Christian pastor 25 years ago. The largest non-Christian population on the island if Fiji is Hindu. There are times in the market or in neighborhoods when you would swear you were in India. There are temples, shrines, monkey flags and red forehead-dots (though not as many since the priestly Brahman, who are the caste that wear the dots, were not typically included in the people the British brought to work the sugar cane fields). There are three religious leaders in the Hindu communities; the high priest, the temple priest and the witch doctor. The high priest, who wears a white robe and a shawl, goes to the homes of families to help them conduct rites, sacrifices and rituals. He is paid very well. The temple priest receives people who come to the temple. They have particular issues they want to deal with so he helps them as they sacrifice (food or chickens, typically). He lives off the offerings received. He wears an orange robe and black beads. The witchdoctor works out of his/her home. You go to see him for blessings, curses (or the removal thereof) and cures. If you go to a witchdoctor, it is generally very expensive. It can be effective, says Pastor John. But it always comes with a curse. Pastor John said the Hindu religion actually helps him tell the Gospel message, since the Hindus all know that they are not “right with the gods” and have to endlessly sacrifice and be cleansed by rituals. It is actually a lot like voodoo in Haiti. They have no peace. The Hindu people are curious, so they will come to the Christian services. There seems to be no real taboo involved in coming to a service, especially since you could be legitimately healed. But when a person actually becomes a Christian from a Hindu community, it can be quite an ordeal. They are ostracized from family and community, so the church becomes the family of each person who is a baptized believer. And they pray. And eventually whole families come to the Lord. The power of God is on display in Fiji and great things are happening. I went on the pastoral visits with Pastor John to be an encouragement to him. But he was a great encouragement to me, and I hope in reading this you are encouraged as well. 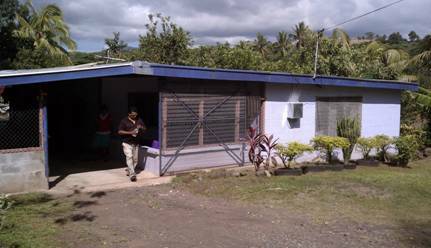 This entry was posted in Fiji, Missions, South Pacific by marknicklas. Bookmark the permalink.